Our puppy Sadie was my first baby. She came home to us when she was just 7 weeks old, but since her mama is my sister’s dog we knew her since she was born, even if we couldn’t tell her apart from the other pups for the first couple of weeks. When K was born this past spring Sadie’s life was changed dramatically. She is no longer the baby, but she has handled it with grace. She loves K, especially when she spits up because Sadie loves to lick it up. It’s pretty great having a built in cleaner, I can only imagine how excited Sadie will be when K starts on solids and learns to drop food for Sadie. I will be in trouble for sure. With a new baby in the house we’ve been making sure to give Sadie a little extra love and attention. It’s important that she still feel a part of the family and that she love K as much as we do and not feel displaced by her arrival. 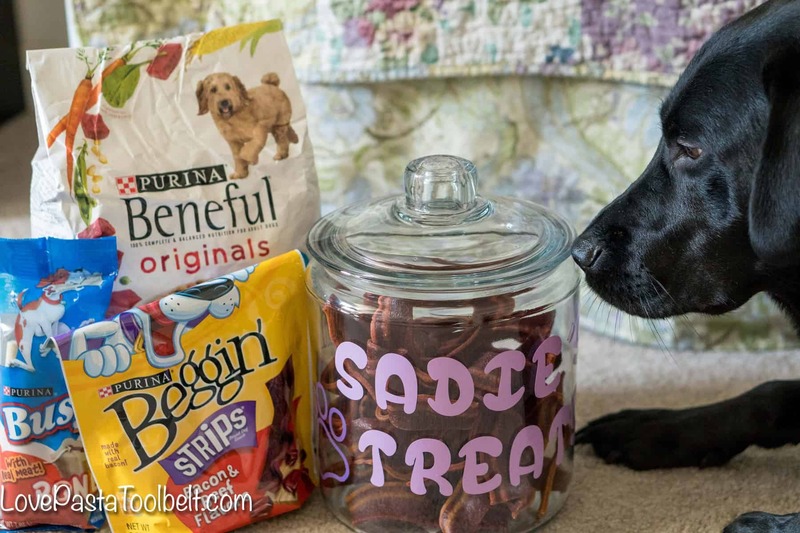 One way we like to help her feel loved, is by making sure she has delicious food and fun treats on hand. I love that Kroger has an entire aisle devoted to our furry friends. Since I do my grocery shopping there, it makes it so easy to just pick up my favorite Purina products for Sadie. 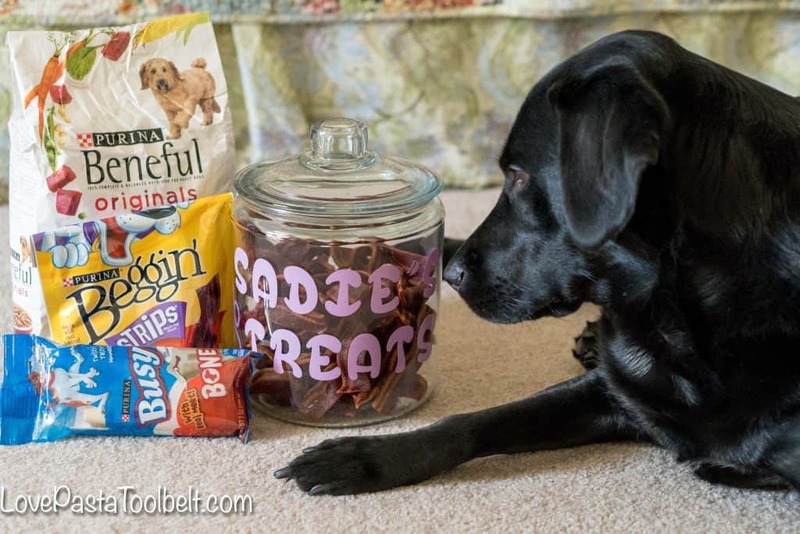 When I was there for a shopping trip I picked some Beneful Dog Food, Beggin Strips and Busy bones for Sadie. With all of these great treats for Sadie I knew I needed somewhere cute to store them. 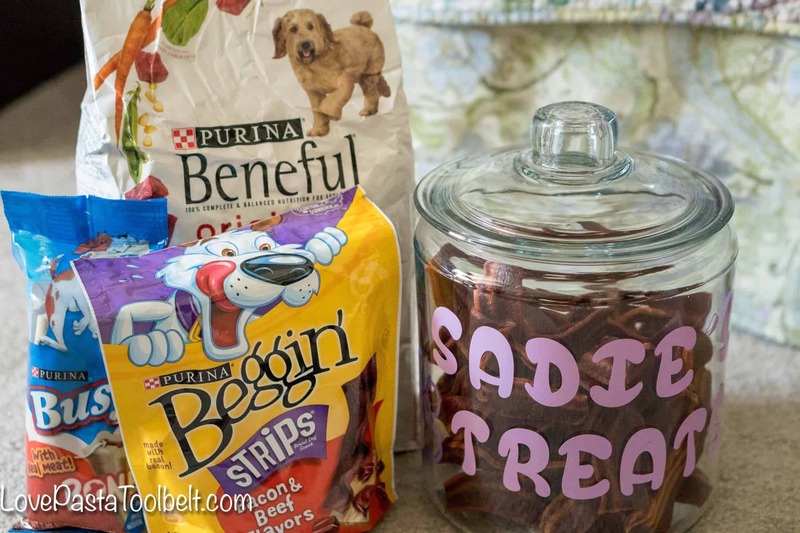 Instead of having all these bags around, I wanted to have the treats in one place and ready for a quick grab whenever we want to treat Sadie. 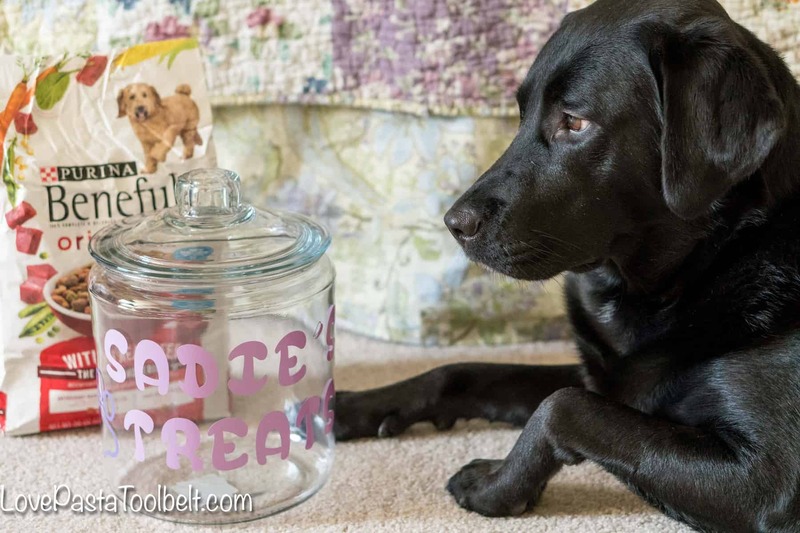 I decided to create her a personalized dog treat jar using my Silhouette. I picked up this cute glass jar at the store as my first step. You can get whichever type of jar works for you and your dog! 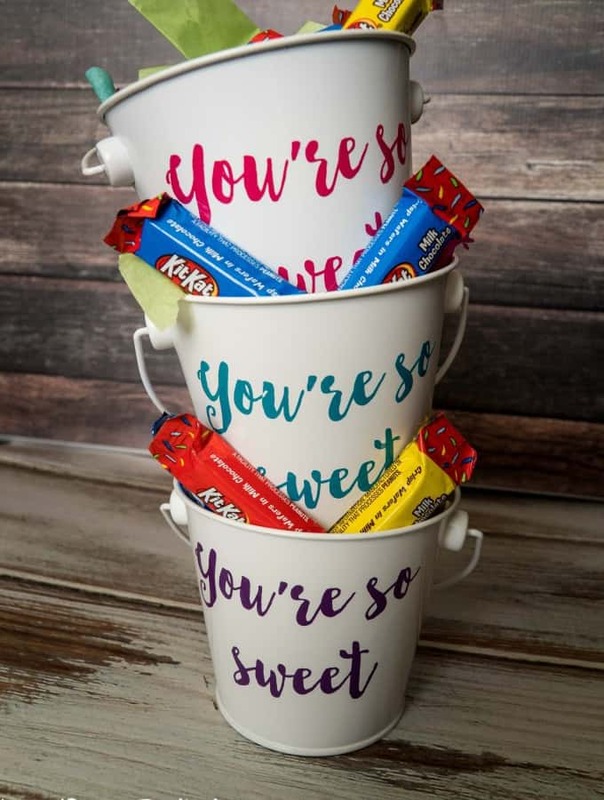 The next step was to use my Silhouette software to design what I wanted to put on the jar. 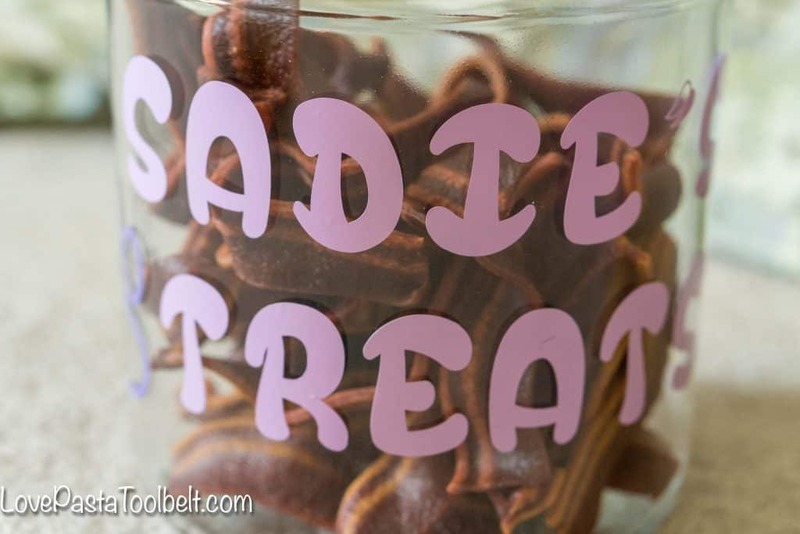 I decided to go simple with Sadie’s Treats and a paw print. I chose purple for the vinyl color because well, it’s my favorite color and Sadie’s collar and leash are purple. 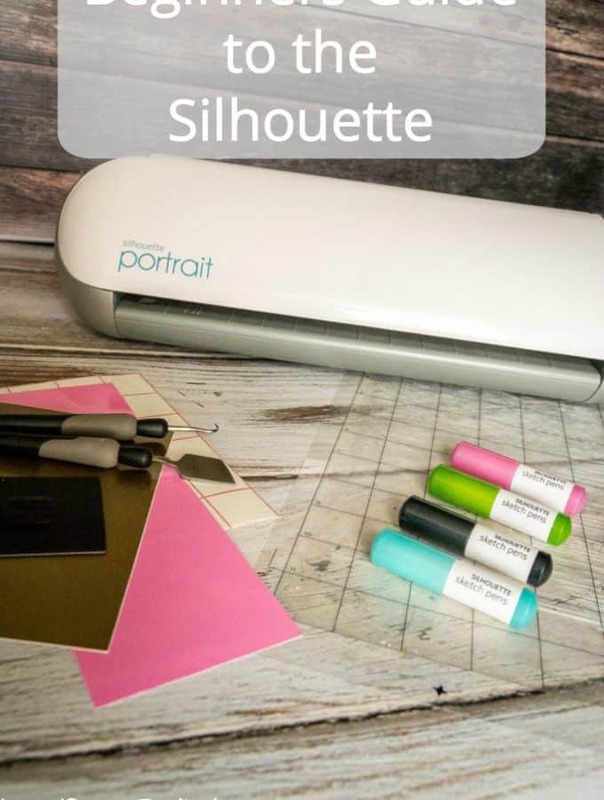 I cut out the design with my Silhouette and weeded it. 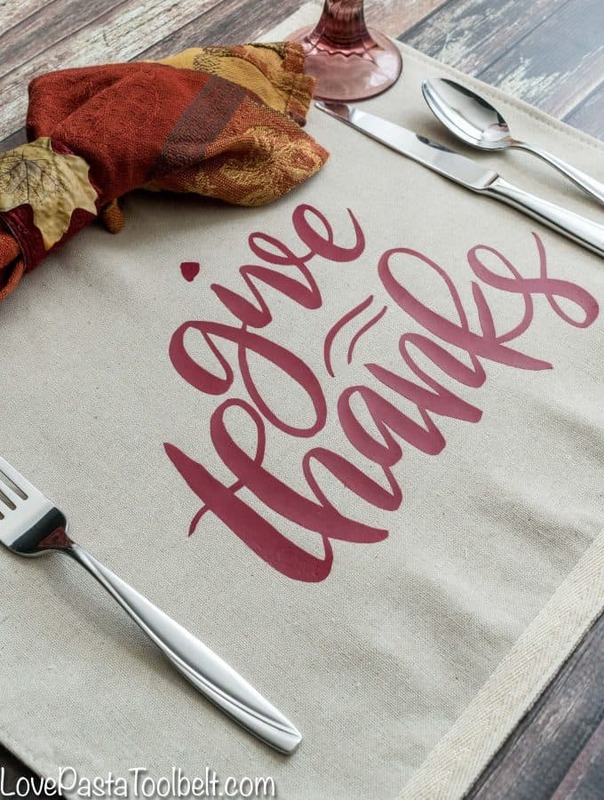 Next I used the transfer paper to transfer the design to the jar. I used my scissors to hold the jar in place so it wouldn’t roll while I was trying to place my design. 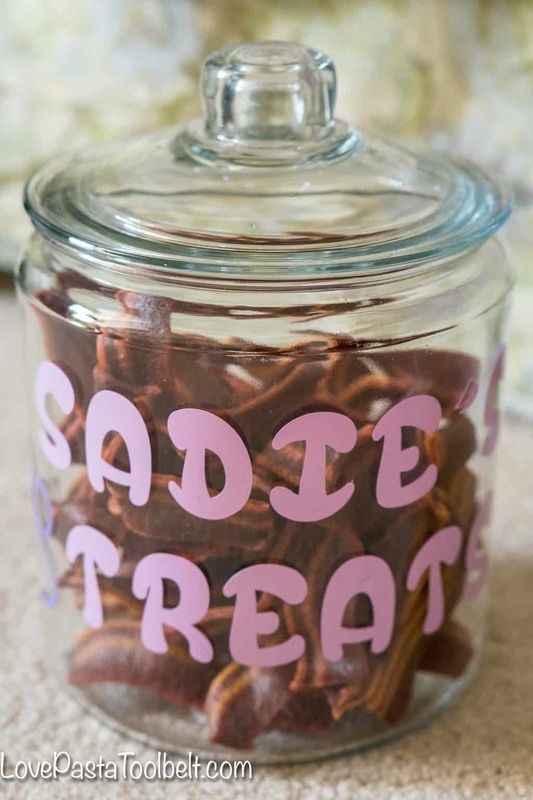 Once my design was set I removed the transfer paper and had a beautiful treat jar for my Sadie girl! I love how this turned out and it’s the perfect way to store all of Sadie’s treats. 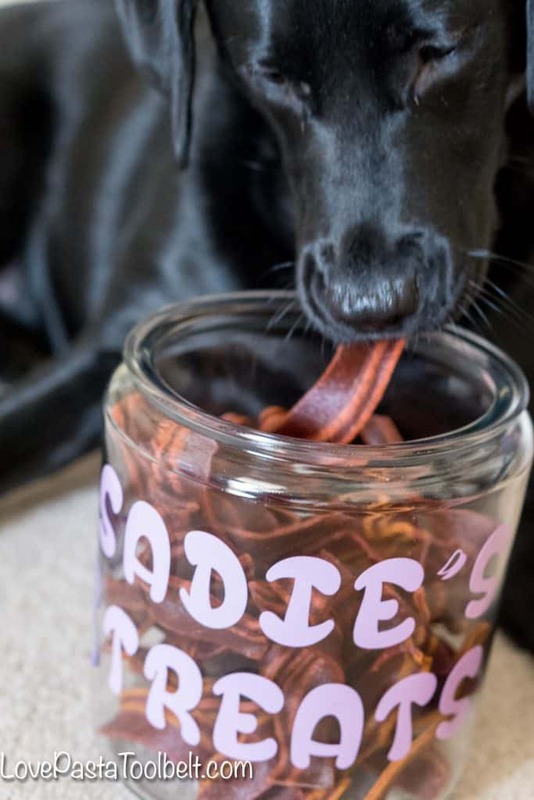 She was pretty excited when she saw me pouring all those yummy treats into the jar. 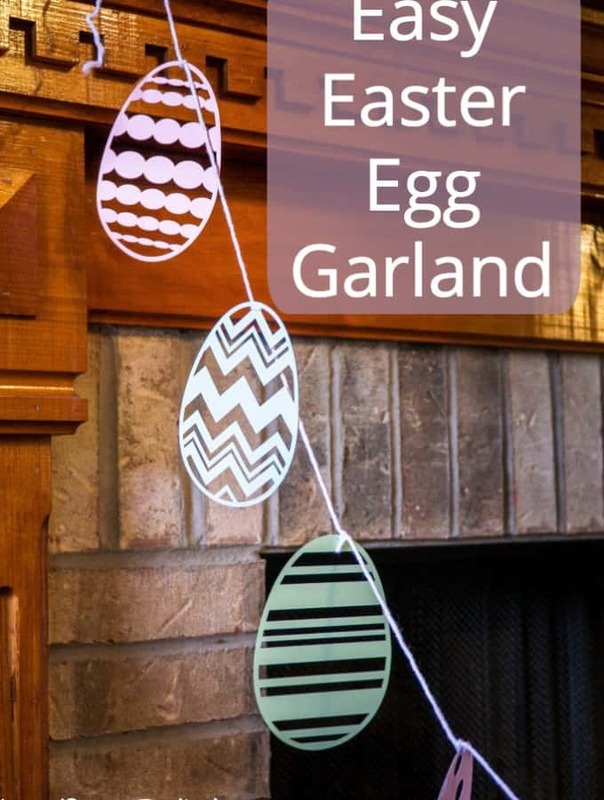 Have you created any fun DIY’s for your furry friend? 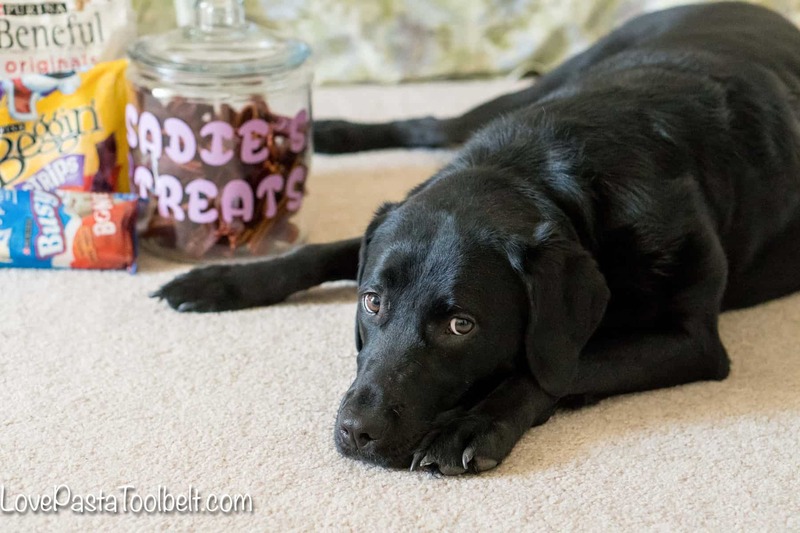 For more DIY inspiration for your pet be sure to head here! 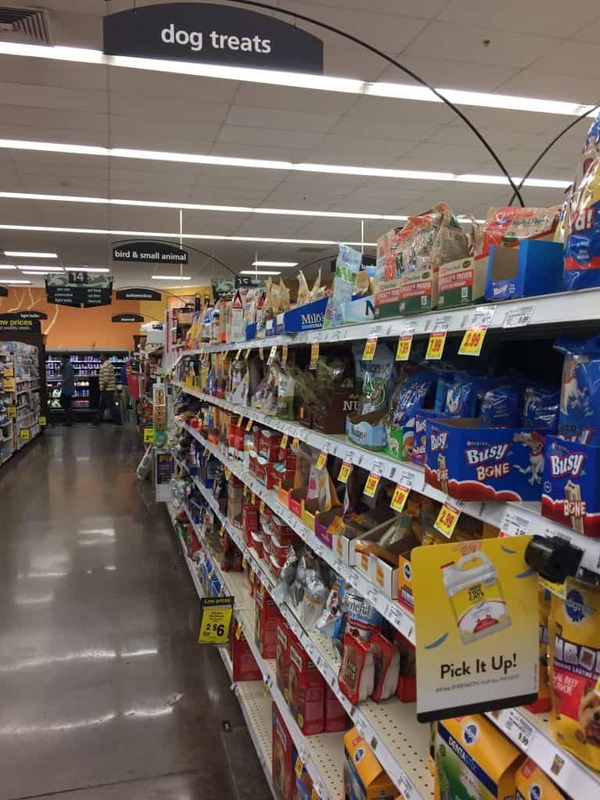 And through the end of November be sure to check out some great coupons for Purina products at Kroger, while supplies last!